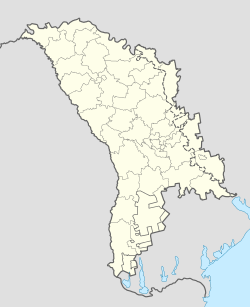 Chişinău (Romanie pronunciation: [kiʃiˈnəw]; or Kishinev (afore 1991), Roushie: Кишинёв, Kishinyov) is the caipital an lairgest municipality o Moldovae. It is an aa its main industrial an commercial centre an is locatit in the middle o the kintra, on the river Bîc. The population o the ceety is 592,900 (2007) that grows tae 911,400 in the hale metropolitan aurie. Chişinău is the maist economically prosperous locality in Moldovae, an its lairgest transportation hub. As the maist economically an socially important municipality in Moldovae, the ceety haes a braid reenge o eddicational facilities. Accordin tae ae version, the name comes frae the archaic Romane wird chişla (meanin "spring", "soorce o watter") an nouă ("new"), acause it wis biggit aroond a sma spring. Nouadays, the spring is locatit at the corner o Pushkin an Albişoara streets. Ae alternative version, bi Stefan Ciobanu, Romanie historian an academician, haulds it, that the name wis formed the same wey as the name o Chişineu (alternative spellin: Chişinău) in Wastren Romanie, naur the mairch wi Hungary. Its Hungarian name is Kisjenő, frae whilk the Romanie name oreeginates. Kisjenő in turn comes frae kis "sma" + the "Jenő" tribe, ane o the seiven Hungarian tribes that entered the Carpathian Basin in 896 an gied the name o 21 settlements. Chişinău is an aa kent in Roushie as Кишинёв (Kishinyov). It is written Kişinöv in the Latin Gagauz alphabet. It wis an aa written as "Кишинэу" in the Moldovan Cyrillic alphabet in Soviet times. Historically, the Inglis leid name for the ceety, "Kishinev", wis based on the modifee'd Roushie ane acause it entered the Inglis leid via Roushie at the time Chişinău wis pairt o the Roushie Empire (e.g. Kishinev pogrom). Therefore, it remains a common Inglis name in some historical contexts. Itherweys, housomeivver, the Romanie-based "Chişinău" haes been steadily gainin braider uiss, especially in written leid. ↑ "Preliminary number of resident population in the Republic of Moldova as of January 1, 2012" (Press release). National Bureau of Statistics of Moldova. 8 February 2012. Retrieved 18 February 2012. ↑ "Ankara Metropolitan Municipality: Sister Cities of Ankara". © 2007 Ankara Büyükşehir Belediyesi - Tüm Hakları Saklıdır. Kullanım Koşulları & Gizlilik. Retrieved 2008-12-08. ↑ Jérôme Steffenino, Marguerite Masson. "Ville de Grenoble - Coopérations et villes jumelles". Grenoble.fr. Archived frae the oreeginal on 2007-10-14. Retrieved 2009-10-29. Wikimedia Commons haes media relatit tae Chișinău.